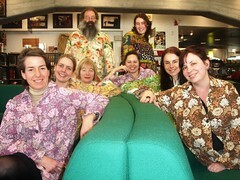 As a riposte to a rather silly debate on the NZ librarians mailing list – CCL smocked back. Blog idol contestant Mo Mo had this to say Let’s get ready to ruuummmbbbbble!. VOTE FOR MOATA! On the mashup tip, might I recommend this Sgt Pepper collection at mashuptown and Go Home Productions This was Pop. + teaching indie kids to dance again – Nirvana goes electro. Lovely advert for Melbourne. Music is apparently by Joanna Newsom. **** Offices and the **** Building. this warren of a building. Thank you. Headline of the month Flaming pyjamas, poisoned trousers from China. Pee yourself over Passive Aggressive Notes … and pedantic fun at Quotation Marks … and Bits on the side. I love The Age (Melbourne) blog Third Best. They are scoping Fashion Week at the mo. ThE gentleman above was modelling at the Leopold show. You know black grundies with white shoes will be the way to go this summer. Keep your fashion footprint light and tight!